My linen quarter pants from last maternity had seen the most wear on the weekend during my pregnancy, and even after pregnancy it is so comfy and cooling, I often wear it during the summer. So I decided that it is okay to make two more for this round to make up for the lack of bottoms in my maternity rotation, and just keep the pants to wear after maternity as well. I bought a bunch of linen from fabric.com and fabricmart.com and made two pairs – white and beige. I think its actually enough! They are essentially the same as my shorts, but simpler without as much decoration. I love wearing them! 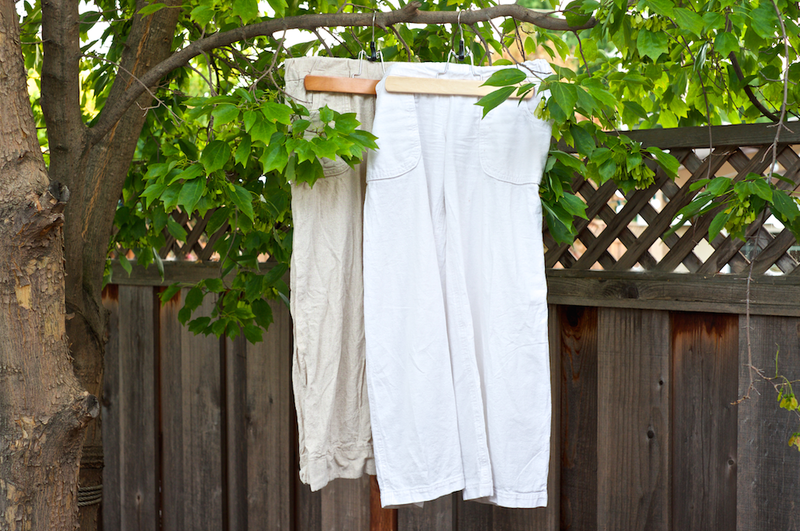 Linen pants are really the best or the summer! This entry was posted on Sunday, June 29th, 2014 at 7:35 pm	and posted in finished pieces. You can follow any responses to this entry through the RSS 2.0 feed. I’ve been loving my linen pants as well, but mine are from Old Navy 🙂 I decided to give myself a pass on sewing things if I didn’t feel like it for pregnancy. Yours are cute and look comfortable though! ah! how very true, i’ve been avoiding sewing myself stuff as well because it wont fit after birth. though i havent tried looking at old navy for maternity – it would had been a good place for basics like this!